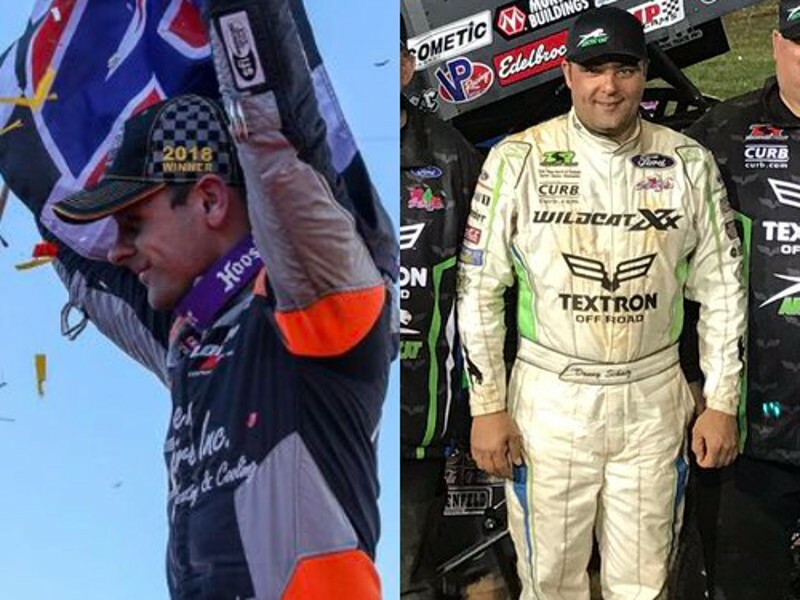 Ian Madsen (left) and Donny Schatz (right) scored victories in the World of Outlaws Craftsman Sprint Car Series season finale on Saturday at The Dirt Track at Charlotte. Schatz also celebrated his 10th career series championship. Ian Madsen and Donny Schatz closed out the 2018 World of Outlaws Craftsman Sprint Car Series 2018 season in fine form on Saturday at The Dirt Track at Charlotte Motor Speedway in Concord, North Carolina. Madsen wrapped up 2018 Rookie of the year honors by scoring the victory on Saturday afternoon, while Schatz closed the season with the win and the series title on Saturday night. On Saturday afternoon, Madsen took control off turn four on the opening lap. Five laps later, Shane Stewart used the cushion to blast to the lead. Stewart would hold the lead until lap 13, when bad luck struck in the form of a flat tire, drawing the caution. Madsen inherited the lead for the restart, and would come under fire from Greg Wilson and Logan Schuart. Madsen held the lead through a caution flag and a red flag condition en route to the victory. “This is an awesome feeling. We’ve been coming to this event every year and it keeps getting bigger and bigger. It’s awesome to be a part of the World Finals,” a relieved Madsen said. Shaffer finished in second, with Schuchart in third, Spencer Bayston in fourth and Greg Wilson in fifth. On Saturday night, Schatz charged from the 10th starting spot to score the victory and put a bow on his 10th series championship. Schuchart challenged Schatz coming to the white flag, exchanging slide jobs, but in the end had to settle for second. Carson Macedo jumped to the early lead in the feature, with Schatz on the charge behind him. Schatz inherited the lead after Macedo suffered a right tear tire with 23 laps complete. Schatz would hold on to the top spot, with Schuchart closing to set up the exciting finish. Brad Sweet finished in third, with Tim Shaffer and Giovanni Scelzi rounding out the top five. For more information on the World of Outlaws Craftsman Sprint Car Series, visit WoOSprint.com.